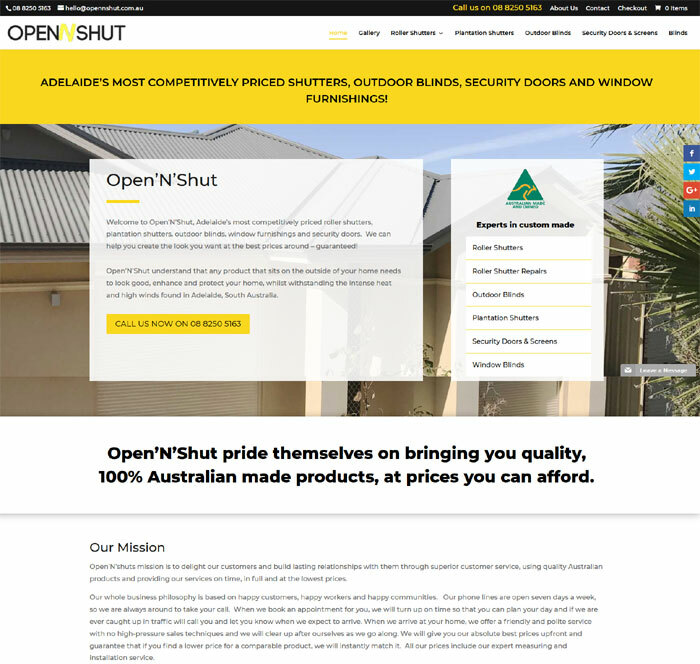 Open ‘N’ Shut Blinds approached Website Adelaide to update and modernise their existing WordPress website. Their original website was looking dated and only contained basic information on the products and services that Open’N’Shut sold. One of the main factors in deciding to update the website was to get more traffic from search engines like Google and increase the number of telephone enquiries. When we looked at the website design, the ‘back end’ of the website was complex and very slow, so Website Adelaide redesigned this for optimal performance and speed. To ensure that the website content (words on pages) was easy to understand, engaging and search engine friendly, we worked with Colette Chorley Creative Content and Marketing to write the web pages and structure the content so that potential customers could easily find the information they were looking for and fully understand the key selling points of the business.